With the 2013/14 National League season now complete, we have compiled a list of match reports for each division. Congratulations to all of the winners and runners-up and a big thank you to all of the participants, and particularly the captains, for taking the time and effort in organising your fixtures and supporting this great event. We hope to see all of the existing teams playing next year, plus the addition of more. Jon and Ben will be happy to watch from the sidelines as Adrian Kemp takes over the administration role for the National League next season. The Royal Tennis Court (RTC) won a tight semi final at home, meaning it was them that had the feat of travelling to Prested to take on a Prested Team, at home.. with a nice rowdy crowd against them! However having won both of the matches against us earlier on in the season, it was obvious they were keen to keep their streak alive. 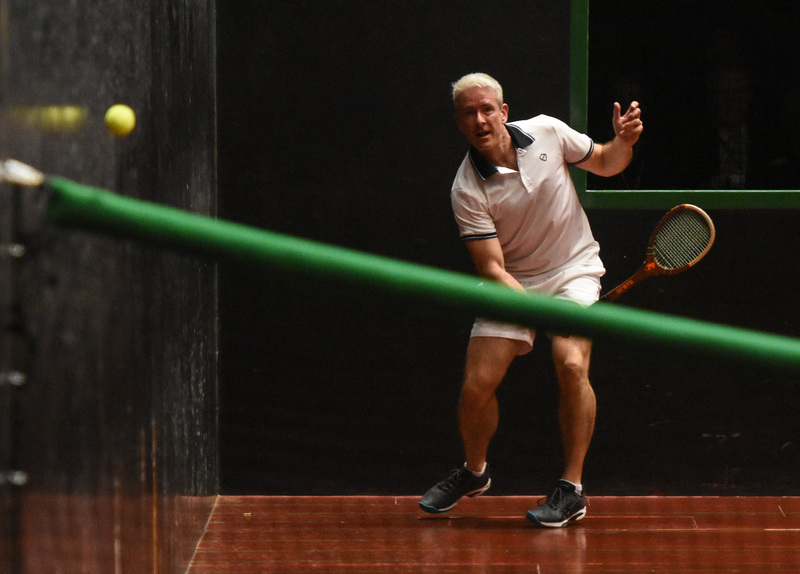 First up was David Watson (multiple winner of over 40+ and 45+ events) against Lewis Williams. Last time they played David won in straight sets so Lewis was keen for revenge, especially when playing at home! I think it was fair to say that I had a quick start to the match and found form early… taking the first set 6/2. David played well at the start of the second set and took a 3/1 lead.. could it go to 3 sets? Not quite.. I managed to take back the momentum and win the match /2 6/4. PRESTED WIN NL DIV 2!! Matt Potter kindly stepped up to play a doubles as Charlie was having some problems with his ankle from the 2nd set, so that provided some entertaining rallies! Thanks to him for that, and marking, and last of all, a great big thank you to all of you who came to watch and support throughout the season. There is nothing like winning in front of a large home crowd, we really do appreciate having you all there!! Long may it, and our success in National league, continue!!! 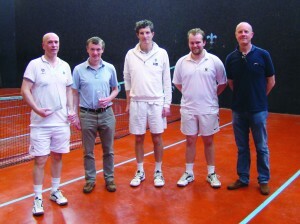 On Thursday 8th May Seacourt took on Queens club in the national league Div 3 final. The competition is a national event and Seacourt played teams all over the country and due to their success at home and away, they were guaranteed a place in the final. Queens had a tougher route and had to play favourites Cambridge in the semi final. Adam Player took on Tom Seymour Mead in the first match and both players excelled in the limelight and raised their game to new heights. Tom looked sharp and very comfortable on court and took his chances and was rewarded with crucial nicks and especially grilles at the big points and won the match 6.4 6.4. Final set and Louis kept his nerve and most importantly the service end and cruised through to win the match (6.2). The title now boiled down to the doubles, which is one 8 game set!. From the first ball it never looked in doubt as Adam and Louis looked extremely comfortable on court and took advantage of John and Tom’s slow start. 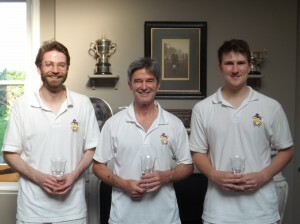 There were plenty of highly entertaining rests and incredible shots but it was Seacourt’s night and they won the title with an 8-2 win at doubles. 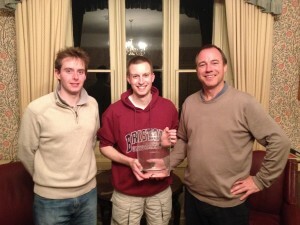 Also to add to an incredible real tennis season Adam was awarded the Most Valuable player in the division. Lewis Davies also from Seacourt was awarded the MVP for division 8. Lewis had a brilliant season and won all his singles matches. Unfortunately Seacourt div 8 team lead by Captain Team Keen Simon Flynn narrowly missed out a place in the play off’s by one win!!! Well played to Adam and Lewis who both received a MVP real tennis racket. Lewis also won best dressed player award for the entire league. Division 4 of the National League very quickly became a three horse race between RTC, Cambridge and Jesmond. RTC did not lose a rubber until their 7th match of the season and went directly through into the final having accumulated 59 out of a possible 64 points. The semi-final between CURTC and Jesmond disappointingly ended in a forfeit putting Cambridge through to the final, which took place at Hampton Court on Saturday 26th April. In a fitting end to the season, the two players at the top of the MVP table faced off in the first string singles. Phil Dunn (RTC) and Jules Camp (CURTC) traded games to 3-3 in the first set but then tight serving and a few uncharacteristic errors from Jules gave Phil the set 6-3. The second set was even tighter with Jules reaching 5-4 but he was unable to reach set point and went on to lose the set 6-5 and with it the first rubber in an exact reversal of their encounter at Cambridge earlier on in the season. 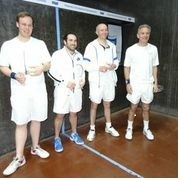 The second string singles was between Alex Evans (CURTC, youth) and Simon Barker (RTC, experience). This rubber was characterised by relentless retrieving from Simon and a few too many unforced errors from Alex. While many of the games did get to deuce, the game points all seemed to go one way with experience triumphing over youth 6-1, 6-2 giving RTC an unassailable 2-0 lead and with it the division title. The dead-rubber doubles was always going to be difficult for RTC without James Sohl in the team (tonsillitis keeping him away). Cambridge dominated the service end with Jules playing calmly at the back while Alex barely missed a volley at the net. After a poor start going 1-4 down, RTC managed to string together a few games to reach 4-4 but that was to be all with Cambridge running out 8-4 winners. 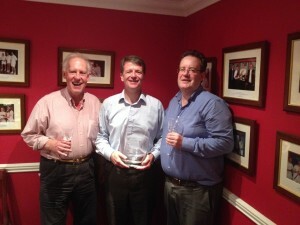 Thanks to Nick Wood for marking the final, to Jon and Ben for organising the league and the IRTPA (?) for covering the marking and food costs for the final. A scorching early summer day signalled that the real tennis season was coming to its close, but the stakes at this point couldn’t be higher. Having been undefeated all year the Moreton Morrel team of Philip Shaw-Hamilton, Tom Bomford and Tom Lewis went into the final full of confidence and expectation. All that stood in their way was the Petworth House team comprising James Law, Nick Harris and Patrick Colvin who had also been on a bit of a roll since Christmas. First to enter the “sauna” was Tom Bomford and Nick Harris. Nick, a giant of a man, began very well; matching Tom’s boasting game and hitting the ball into all the targets with extreme power. Tom seemed to struggle to adjust to the pace of play and made several uncharacteristic mistakes, falling 4-3 behind. Were Moreton rattled, was the occasion getting to them? Not one bit, Tom regained his composure and sailed through the next 6 games in a row to take the first set and a 3-0 lead in the second. This proved enough to break the confidence of Nick who began to miss his targets more frequently and Tom ran out a comfortable winner 6-4 6-2. 1-0 Moreton. Next, Philip took on Patrick and with both players retrieving fantastically the score had only edged to 2-2 after what seemed like an age. 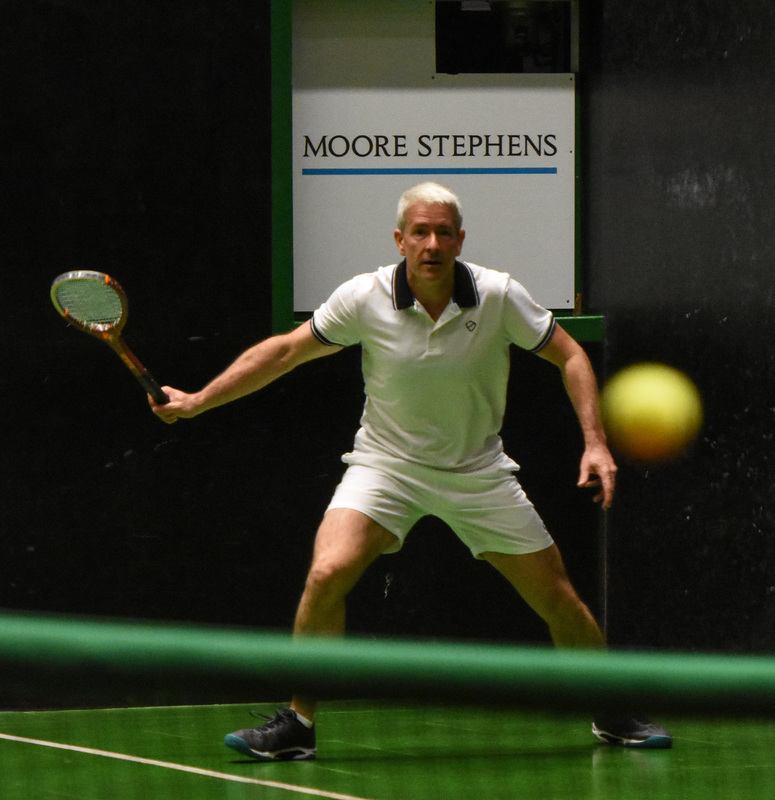 However, Patrick began to find the corners with good length and pace, and with Philip making a few errors off the return of serve and penthouses, Patrick took the first set 6-2. A couple of tight marking calls caused Philip to refocus in the second set, carving the ball around the court with more cut and conviction, cruising to a 4-2 lead. Patrick’s retrieving began to wear on Philip but at 5-4 it still looked like the match would go to a 3rd set. Unfortunately it was not to be as Patrick went on to win 6-2 6-5. Moreton Morrell 1, Petworth House 1. Finally, it was the decider between Tom Lewis and Petworth assistant professional James Law. Tom, wielding his league MVP racket started strongly with his solid serve and return of serve game. With James making a lot of errors as he struggled to adjust to the court, Tom stormed through the first set 6-1. It looked as if the second set would go in the same fashion, but Tom dumped a series of easy winners into the net, highlighted by a double fault on game point, chase 1 yard. This culminated in James taking a 2-1 lead, giving him the confidence to start cracking some nice volleys off Tom’s forces. At 4-4 it all looked a bit nervy, but in spite of this Tom came out on top in a couple of long rests to take the set and the match 6-1 6-4. With that Moreton clinched the title for the 2-1. Well done to all of the players for 3 hard fought matches and thanks to Philip for his organisation throughout the year. 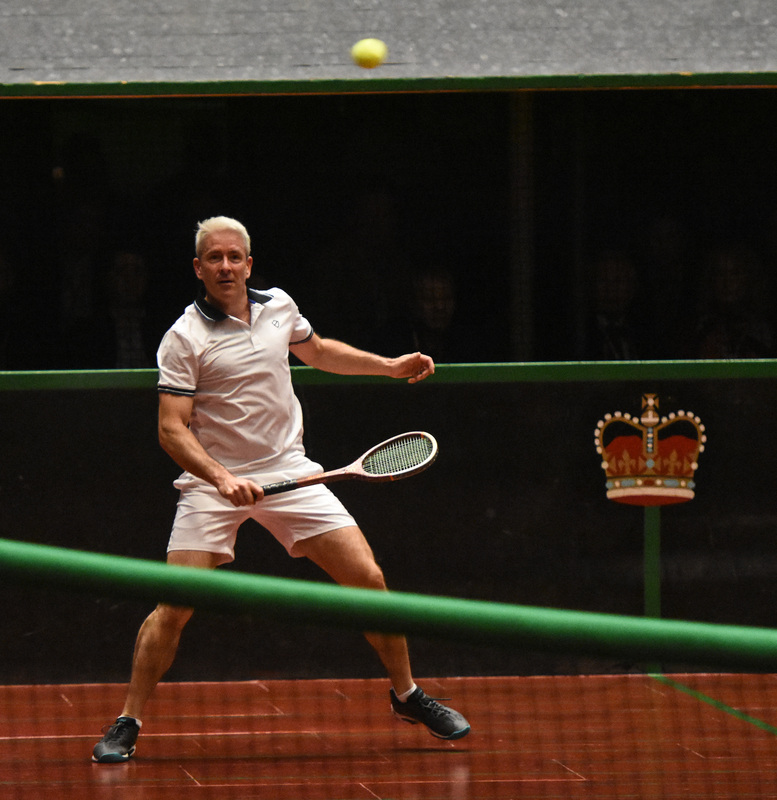 Cambridge and the Royal Tennis Court finished well clear of the chasing pack in Division 6, and RTC duly dispatched Canford 3-0 in the semi-finals to set up a final showdown up in Cambridge. RTC were quick out of the blocks, as second string Stephen Goss took the first set 6-0 against William Russell. The home player is a fighter, however, and he cut down the errors to claw his way back into the match. William took the second set 6-2, but the third set was much tighter than the previous two, swinging one way and then the other. The turning point came with Stephen serving at 3-2 and 40-0 up, as William snatched the service end and then the game before stepping up a gear to close it out 6-3. First blood to Cambridge. Next up, RTC third string Chris Bartley also started well against Charles d’Oyly, making full use of his long reach and adept retrieving. After a 6-1 first set, he carried on the good work and was strolling to victory until, at 5-1, that last game began to prove elusive. A match point at 5-3 passed as a long, tense ninth game went to Charles – but just in time Chris steadied the ship to take the set and match 6-4. That left RTC’s Simon Edmond, the division’s MVP, in a winner-takes-all battle with opposing skipper Jimmy Campbell. Simon broke the visiting team’s trend by starting terribly, and a comeback from 1-4 down proved too much in the first set, which went to Jimmy 6-3. 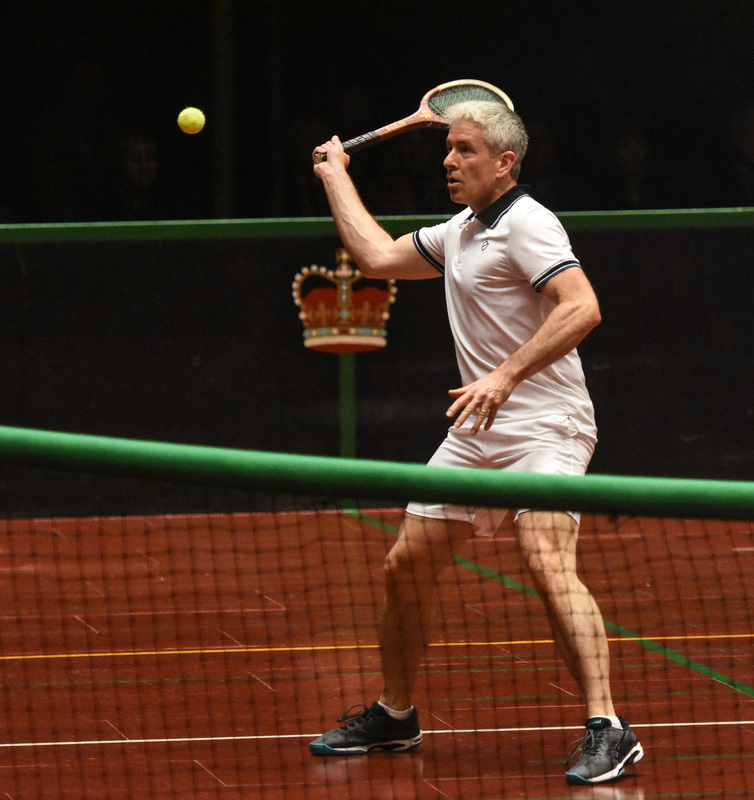 Having found his length, Simon got on top early in the second and took it 6-3, and after the early games in the decider were traded Simon made the crucial move ahead from 2-3, as Jimmy began to struggle with blisters on his racket hand. Eventually Simon took the set 6-4 to seal the title after a five-hour marathon (not least for marker Peter Paterson). For the second year in a row in Division 6, RTC had won an away final to take the title. After what seems a long season of National League the two teams in the final had not played each other during the season, and so there were no results to base a prediction. 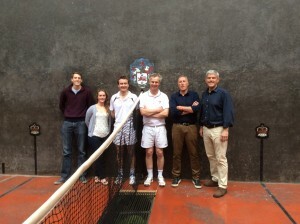 The first match pitched the two captains together with Paul Wright and John Savage playing. Paul got off to a quick start and took the first set 6-1. John then started to get the measure of the court and pulled into a 2-0 lead. But could not manage to level the sets – going down 6-3. With the final score 6-1, 6-3 RTC pulled into a 1-0 lead overall. Next up was Fraser Shorey against Hatfield’s Silas Manhood who has been having a fabulous season reaching a handicap of 27 at the start of the month. Well it started and there was a bit of spar-ing. Not quite Froch and Groves, but some shots were hit and taken. As per usual Fraser started to make his fitness tell. Smoothly moving around the court as if he was on wheels and both players looked to play the volley to keep there opponents on their toes…Fraser prevailed and won the first set 6-2. The second set saw Fraser starting to use the backwall a little more and again he pulled ahead. And Fraser’s relentless retrieving coupled with his attacking game saw him take the second set from the oppo ( who was one point off being MVP ) 6-2 …. and victory was claimed. Third up was George Sleightholme and the question was could he beat the fast improving youngster from Hatfield Chris Aley. Chris who is continuing his real tennis education in the States ( lucky fellow ) had improved his handicap about 3 points in the last month before the final! A tough order, particularly as George had been spending the previous week in Malta on what sounded like a mass booze cruise – fab! So the match started and Chris, who seems to move very well with “little” steps and almost prepares his racket before his opponent has returned the ball! ( yes I know Woody it looks easy – I just don’t seem to be able to do it!). Chris was hitting the ball very well and consistently hitting the dedan. And at 6-2 to Chris in the first set the writing looked to be on the wall. Chris started the second set well and George looked tired . George was grafting hard and began to improve his volley return of the dedan forces and this kept him in the game. And slowly the tide started to turn and George willed himself into the lead and clinched the second set 6-4. So it was 1 all. Game on. Chris was still looking fresh , but George was starting to look very fatigued, as if he’d been out on a bender in Valletta – so what would happen in this final set? George was now starting to craft a game that was putting Chris under pressure and ensued many a mighty battle. But through sheer determination George willed himself ahead and finally took the bout 6-2. Good on you George and RTC took the final 3-0. A great final ( for RTC ), played in very good humour, which saw the home advantage prevail and RTC got presented with the National league trophy ( which had been hiding for a few years! ) for division 7. The Oxford team dominated the group matches and finished top. This included a convincing 3-0 away win at Petworth . Their only loss in the group matches was a home match also against Petworth. After scraping into the play-offs, by only one point over RTC and Seacourt,, Petworth hit their stride with a close 2-1 win over MURTC in which George Andrews won a typically close hard fought match (5-6, 6-5, 6-4), injuring himself in the process. Petworth captain David Fortune felt relaxed enough to go on holiday for the final leaving Charlie Maunder, Richard White and replacement Simon Armstrong to play the final against Oxford alone. In the first match Charlie took on Oxford top seed Jean De Pourtales and won the first set. Jean came back in the second set but Charlie secured the third set winning 6-3, 3-6, 6-3, it was close all the way. Second string Richard White then played Will Rowsell who won the first set making full use of his dynamic serving action but then Richard started the comeback of all time. However, at 5-3 up in the third set it looked like Oxford were about to level the match . Unfortunately for Will, Richard had other ideas and played all the critical points with determination and skill. In the end winning 2-6, 6-4, 6-5. Shortly afterwards Richard was heard to remark: “I never give up! ” So Petworth had won the match 2-0. In the dead rubber the left-hand railroad serve of Chris Milford was too strong for Simon Armstrong; Chris won 6-1, 6-0. After the match the Oxford team provided excellent dinner and wine, gratefully received by Petworth, before they travelled home. The final of the division 9 National League saw RTC travel to Moreton Morrell on Saturday 31st May. The first match had Martin Trees (MMTC) take on Justin Gregory (RTC). Justin got off to a good start and took the first set 6-3. After a couple of tight games with numerous deuces at the start of the second, Justin went into a 5-0 lead in the second set. Martin launched a late comeback, winning 2 games on the bounce, but after regaining the serve, Justin managed to close out the match, winning the second set 6-2. 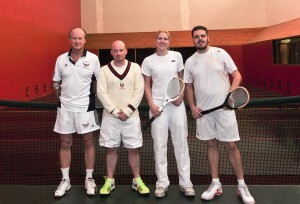 The second match saw Alan Moug (MMTC) against Harriet Ingham (RTC). Harriet got off to a quick start, racing to a 3-0 lead in the first set. However Alan started to find his range and after winning a 15 minute game to get to 3-3, took the first set 6-4. Harriet regrouped during the second set and after some good tennis won the second set 6-3. There was never a lead of more than 1 game in the third set, with Alan nipping in front and being constantly pegged back. Harriet went ahead at 5-4 and had 2 match points, saved with some excellent serving by Alan. The deciding game was nerve racking for all spectators, but some more excellent serving from Alan helped to see him over the line, winning the final set 6-5. The deciding rubber was Steve Watson (MMTC) against Richard Lawrence (RTC). Steve took a 5-3 lead in the first set, and despite a comeback from Richard took the first set 6-5. Again Steve took a lead in the second set, going 4-2 up, before Richard mounted another comeback to take the second set 6-5. The league came down to a deciding set, and considering the circumstances the level of tennis was very high. Neither player could get a lead of more than a game, but with the set level at 4-4 Richard managed to find some good serves and went 5-4 ahead. Steve found a good return in the final game for chase 2 yards, and the players changed ends at 40-15 to Richard. A great cross-court return falling at 1 yard saw Richard win the match, and RTC took the match 2 rubbers to 1.